We often talk about various inspirational stuff including commencement speeches which fall in the “inspirational and motivational” category. Here are some of the other books in the same category we’ve reviewed so far. Keys – The HLP Way To A Regret-Free Life by Santosh Joshi. 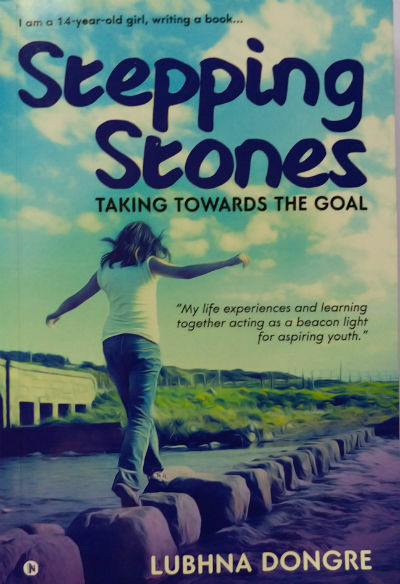 Recently we came across a book named Stepping Stones: Taking Towards the Goal by debutante author Lubhna Dongre. This book also falls into the same category. Let us take a look at the cover page. Of course, we cannot judge a book by its cover (Lubhna talked about this saying in this book in detail), but it surely creates the first impression about the book and influence reading and/or purchase decisions. So we must talk about it. The cover page of this book is simple and effective and it suits the content of the book. Reading this book is like reading the transcript of an inspirational Ted Talk. It is distributed in various segments and each segment has many chapters. The good thing about the book is you can start reading any chapter and you will have no continuity/discontinuity problem. Of course, the recommended way is to read it from beginning to end. But, in case you cannot find time to read the entire book in one go, then you can enjoy reading it in chunks also. Whatever your dream is, don’t limit yourself just because you think it is impossible to achieve for you. But there is nothing here which is impossible for anyone. Comfort zone is a risk free life when everything is going regularly and comfortably. The other satisfactions we get the videogames to competitiveness. We start to compare ourselves with other’s scores. We are a treasure house in ourselves. Your talent mean something to your but something else to others. At the same time, she assessed the way of living, which the current generation is following, quite nicely. She talked about paying attention towards health and even eating habits. Because without a healthy body, you cannot work effectively. We all know this fact, but, we often ignore it till we reach the point when our body starts demanding attention due to wrong reasons. In the walk of life, a few people actually give time to themselves. Everyone is more concerned to look good than to be good. It is difficult to live a life of significance and to make an impact on the society, but when one does he/she eventually achieve life’s purpose. When you stop to learn, you actually stop to live. Self learning needs a high degree of motivation an willingness because there will be no one to judge you and teach; everything is to be done for personal betterment and for self improvement and helping others too. She, however, makes it clear that learning is not just getting school/college degree(s). Getting good grades are essential but more important is learning and understanding. Like the above line where you may find a grammatical error, there are a few places where the things could have written in a better manner. …, they are working hard for their needs and wants to fulfil their needs and their families. This paragraph doesn’t connect with the next paragraph effectively. When the author is freely expressing her views, some readers may see a little arrogance in the same. She however humbly explains her point at various places about the same. Some of the lines like the following are really worth remembering. A wrong decision puts a person at a risk whether it is big or small. She has contacted a large number of successful people to know their vision about success and how they have achieved it. She approached them to convey something worth sharing which can guide the readers in their journey of success. And she got responses from many such leaders from various professions. There is a segment containing such EMail/Letters which is worth reading. While there are so many political leaders, businessmen, motivational speakers, educationalist and other experts who’ve expressed their thoughts, I will mention those from the leaders of Indian armed forces. It is often considered that they are tough people and while living a tough life and guiding war operations and tactics and living a hard life they might not be getting time for reading or other such soft things. On the contrary, they all are well read, humble human beings. They all, almost unanimously expressed that “there is no shortcut to success”. Be honest and never cheat. Your parents will also stand for you so always listen to their advice. Respect your teachers, they are always your wellwishers. The author has weaved all these messages and other motivational stuff which inspired her in her writing and attributed the same as well. It is interesting to see author sharing her photographs with some remarkable people she got a chance to meet with and/or influenced her. A small addition to that – her photo with her parents – will make the album complete. Also, the readers may find book price quite high. So, there are a few points where the book needs improvement but overall it is a nice read. An important thing which I kept to talk about at last is, Lubhna is a school student and she penned down the book at the age of 14. The clarity of her vision and thoughts at this age is remarkable. I wanted to talk about it at last because, otherwise, the rest of the article could have been read by the reader in that context. Emotions play a vital role in influencing us. And the discussion about book’s positive/negative attributes must be objective. The book is not only for the youngsters seeking motivation or inspiration. If you read it carefully, you will find several parenting lessons also. For example, the author is living tuition-free life. Her parents didn’t stop her from reading non-course books. Even when there are board exams scheduled, she started writing the book and she was supported by her family. The healthy family environment made the author in growing up as a human being with a clear vision and keep reality check when implementing her thoughts into actions, which is very essential. The author aspires to become an IAS officer in her professional life and I am sure she can have a professional career as a motivational speaker as well 🙂 . If you are looking for an inspirational and motivational reading experience, this book is a good choice. You may find it a little costly. It is of course not for light/time pass read. It is a book with a substance.